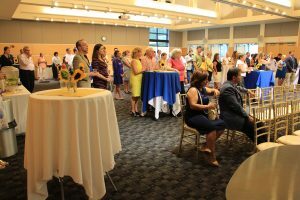 Northern Essex Community College President Lane Glenn hosted a warm welcome for two of Haverhill’s newest community leaders on Monday, August 6. Northern Essex faculty and staff as well as Haverhill community business leaders, educators, and elected officials greeted Margaret Marotta, Haverhill’s superintendent of schools, and Dougan Sherwood, president and CEO of the Greater Haverhill Chamber of Commerce, at the evening reception, which featured a brief program. A theme that ran throughout the evening was the progress that can be made when the school system, local college, and chamber of commerce work together to educate local residents and prepare them for careers. “We need a strong educational system and strong workforce development so our youth can go right from high school to college to jobs,” said Attorney Paul Magliocchetti, chairman of the chamber board and vice chair of the Haverhill School Committee. 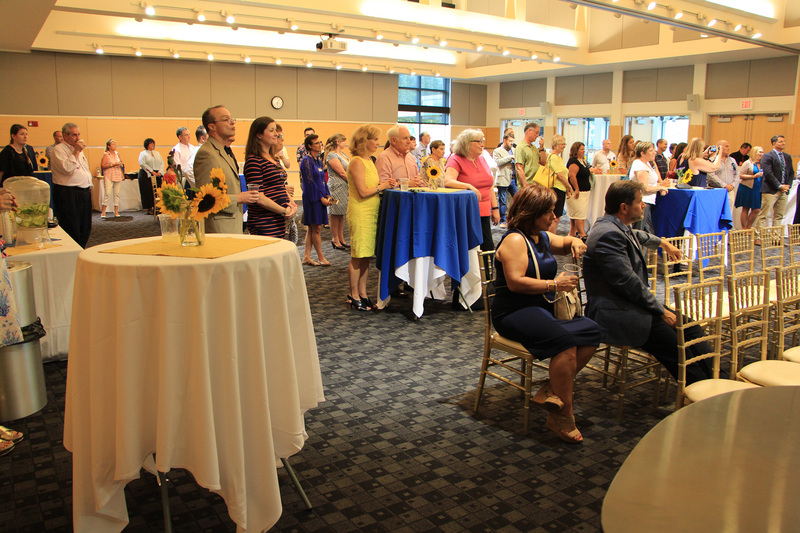 One-hundred people attended the September 6 reception at NECC welcoming two new Haverhill leaders. Margaret Marotta comes to the Haverhill Public School System from Salem, MA where she served as assistant superintendent for the last six years and as director of pupil personnel services for two years. Northern Essex President Lane Glenn, who introduced Marotta and emceed the program, said “She has considerable passion and experience in areas such as special education, English for non-native speakers, and public safety. Sherwood was most recently in Cambridge, MA, where he was managing director of new markets for the Cambridge Innovation Center. Before that, he was co-founder and managing director of the Cambridge Innovation Center in Greater St. Louis. “Haverhill is a new environment for me…but I know economic development,” said Sherwood. He shared that in November the city is hosting a hackathon, which will bring together data-driven professionals who will meet for 24 hours to solve a problem submitted by a nonprofit, city department, or neighborhood group. “I want to attract more people from the outside to Haverhill, especially in technology,” he said. In addition to serving on the Greater Haverhill Chamber Board of Directors, Glenn was a member of the search committee that hired Haverhill’s new superintendent of schools.